Hanamichi : Happy New Year 2016! My holiday season began with the 2015 Advent Tea Calendar theme of "12 Teas from Japan". 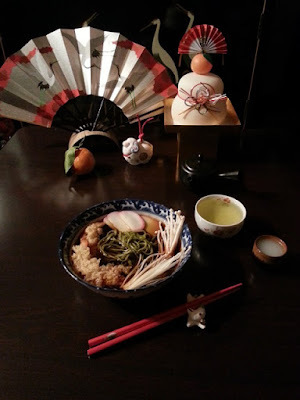 New Year's Eve was quiet and I enjoyed a meal of toshikoshi soba (year-bridging noodles) using matcha soba from Itohkyuemon and fukucha sencha from Fukujuen. New Year's Day had a busy start with the Resolution Run 5k in the morning and Hatsumoude (first shrine visit of the New Year) at Tsubaki Grand Shrine in the afternoon. I was able to relax at home that evening with a hot bowl of zenzai, a cup of fukucha sencha from the shrine, and a cup of Midnight Midori green tea sake from Itohkyuemon to ward off the day's chill. 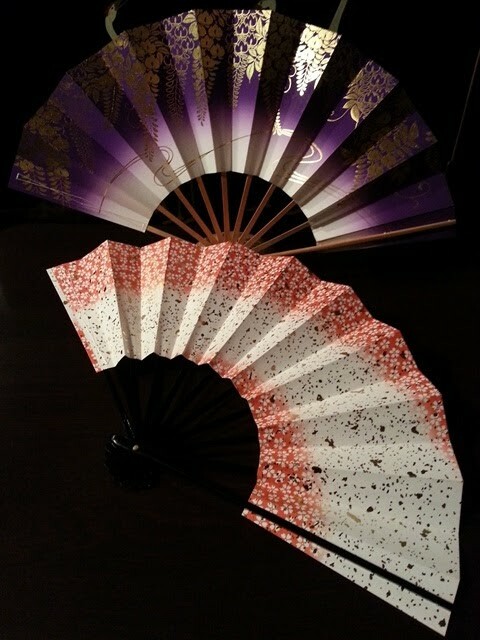 Last week was my first Japanese dance lesson of the New Year. Now I am learning a new challenging dance, Sakura, Sakura, and refining Fuji Musume. I hope to perform them later in the year. Now, I'd like to share the New Year greeting from the lesson. Traditionally, the first greeting we say to each other before a lesson is "Ohayo gozaimasu" (It's early). You may know this as a morning greeting (Good morning), but with lessons it is the appropriate first greeting at any time of day. This is followed by "Dozo yoroshiku onegai itashimasu" (Please guide me/I'll do my best). For the first lesson of the New Year, we say "Akemashite omedetou gozaimasu" (Happy New Year) followed by "Kotoshimo yoroshiku onegai itashimasu" (Please guide me/Thank you for your support in this new year). 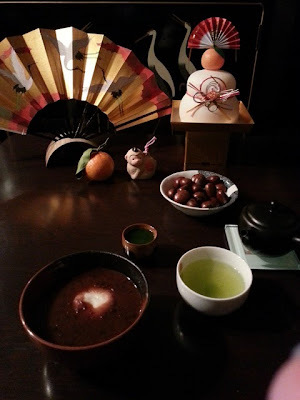 I look forward to sharing many more tea moments from the Autumn trip to Japan and to continuing to share reviews of new teas, tea rooms, tea shops, and tea events! Happy New Year! May it be filled with good health and happiness!